Homes England, the Government’s housing accelerator, has today announced a further £63 million investment in the Northern Arc at Burgess Hill in West Sussex, where up 3,500 new homes will be constructed. The funding injection, which comes from the Government’s Land Assembly Fund, will allow the construction of key infrastructure – including roads, a bridge, landscaping, drainage and utility works – to be accelerated at the eastern and western ends of the site, enabling 1,250 homes to be built. From 2023 the centre of the site will then be developed, providing 2,250 further homes. The news comes as Homes England announces Countryside Properties as developer for the Freeks Farm area of the site. Countryside will start building the first phase of 460 homes in March 2020, on the east of the site. It is expected that these will be completed from December 2020, providing a mix of apartments and one to four bedroom houses. Their proposals prioritise design quality and use of Modern Methods of Construction. “As the Government’s housing accelerator we’re using our land, money, powers and influence to make homes happen in the places they are most needed. 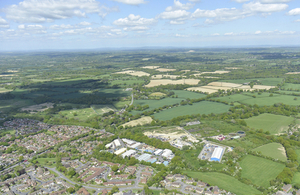 “Burgess Hill is a shining example of how our £1.3 billion Land Assembly Fund is rising to meet the challenge of delivering more, better, faster home construction – helping to deliver up to 3,500 extra homes for the people of Sussex.